I have a student named Clara – a third grade elementary student. She's quite smart and charming and has a better focus than most 3rd graders when she wants to. But she also is a bit morbid and strange sometimes – a kind of proto-goth-girl, personality-wise. She will say these unexpectedly morbid things, sometimes. 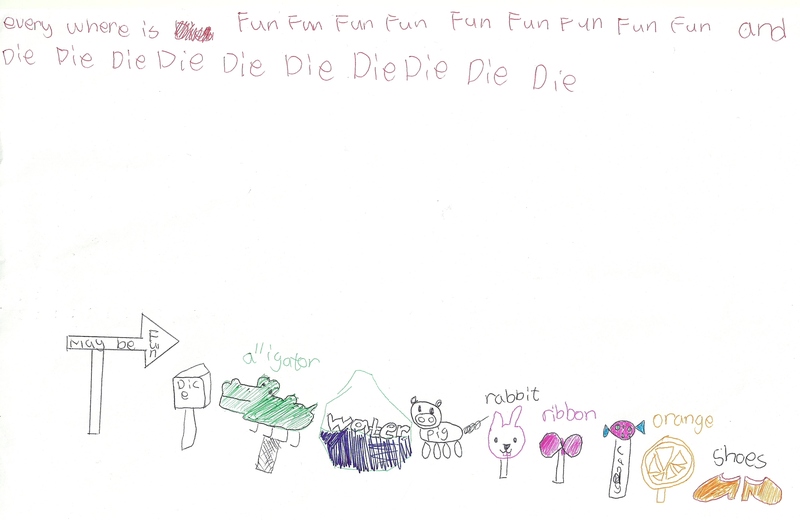 I was going through some drawings we did in class last month, cleaning out a folder on my desk, and found this picture. It seems innocent enough, until you study the caption ("every where is Fun Fun Fun Fun Fun Fun Fun Fun Fun and Die Die Die Die Die Die Die Die Die Die") and try to puzzle out any kind of meaning at all to the sequence of symbols at the bottom. It strikes me as a kind of accidental surrealism, and I was compelled to an outburst of apophenia in reaction, as is intended in surrealism, I suppose.